The UX Component is used exclusively to create Mobile Applications. The UX Component is one of the basic building blocks for Alpha Anywhere applications. It is generally the main component for creating mobile apps. All components in Alpha Anywhere can be used to build web applications. A variety of highly-customized components are available to provide specific functionality, such as calendars, image galleries, or video players. Note that everything that you can build using other types of components can also be built using the UX Component. The UX Component is one of the basic building blocks for Alpha Anywhere applications. It has a wide range of controls that are optimized for speed and performance in mobile and web applications. A Grid Component is used to provide an interface for viewing and modifying data in database in web applications. For a lighter-weight alternative, consider the List Control in a UX Component. 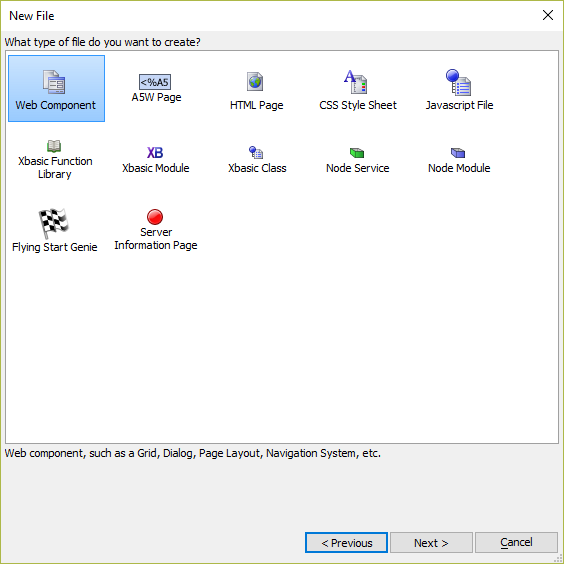 The Tabbed UI Component can be used to create a tabbed interface for a web application. The Page Layout Component is used to create a complex page layout for a web application. The Navigation System component can be used to add horizontal or vertical toolbars with submenus, allowing you to add navigation to a web application. The Login Component provides a way for users to log in to an application in which the Web Security Framework has been enabled. A Login interface can also be created using the UX Component. See "SecurityFramework-LoginComponent" and "SecurityFramework-LoginComponentMobileApp". The Maintenance Component can be used to perform maintenance on DBF tables used in any application built with Alpha Anywhere. The Google Map Component can be used to display a Map that uses the Google Maps API. A Google Maps API key (set in the Project Properties) is required to use this component. See also Alternative Views (Grids) and the UX Component Map Control. The Video Component lets you display and play an HTML5 video, Flash video, or an embedded hybrid of HTML5/Flash video and player from YouTube. See also the VideoPlayer, VideoPlayer (mobile-optimized), and VideoRecorderPlayer controls in the UX Component. The Calendar Component is a third party component that allows you to display and edit appointments, events, etc. It requires a Web2Cal license, which must be purchased separately. The Image Gallery Component can be used to create an image gallery that displays images stored in a folder on a server. The AppLauncher component can be used to determine the type of device a user is running on and dynamically load a component that was designed for the device. This same behavior can be accomplished by building a response UX Component. Several legacy components are also included in Alpha Anywhere These components are for compatibility purposes only for applications built using older versions of Alpha Anywhere. These components are obsolete and should not be used in applications built using Alpha Anywhere. The Dialog allows you to create forms to prompt the user for information. The Dialog (Classic) does not support Ajax callbacks nor does it work with Alpha Anywhere's security system. Use the UX Component instead. The Grid Linker component allows you to link two or more Grid components in a one-to-many relationship. The same thing can be accomplished using Linked Grids or Row Expanders in a Grid Component. the Tabbed Grid Linker component displays a parent Grid component with a series of tab buttons that allows you to select which component to display. The same thing can be accomplished with Linked Grids or Row Expanders in a Grid Component. New Components can be added using the New button on the Web Projects Control Panel toolbar. The New button will open the New File dialog. Select Web Components and click Next. Choose the component to create from the choices shown. 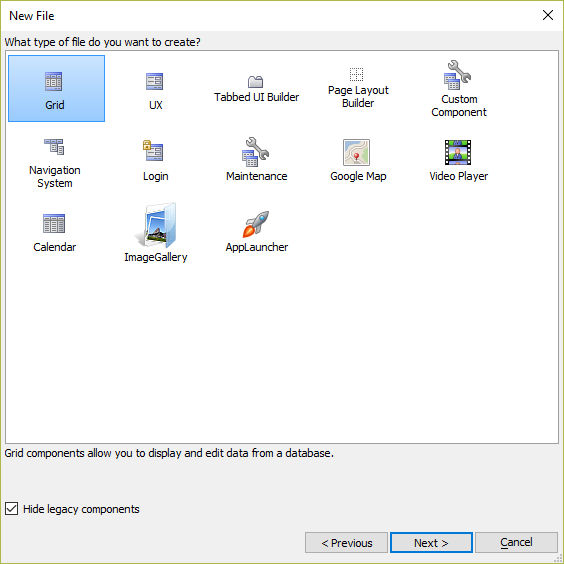 The New File dialog displays your installed user-defined components in addition to all the provided system components. Legacy components are shown below all other components and are hidden by default (recommended).